You need to specify the URL to the original content present on your site, the URL of the scraped content and the search result URL that is displaying the scraped site. 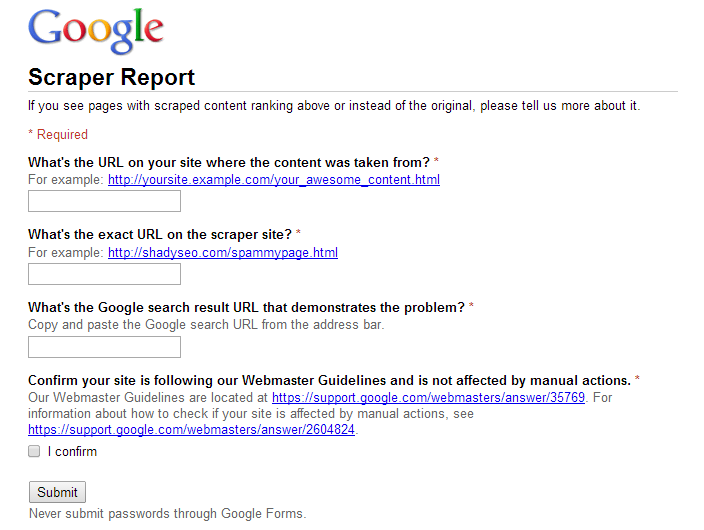 You also need to confirm that your site has not received any manual penalties by Google. 1- When should I file the scraper report? If you see any site ranking higher in the Google search results that has copied content from your site then you should immediately file this report. 2- I see my site ranked below the scraped site..should I file a report immediately? Yes, you must do that instantly. 3- Will filing scraped content guarantee my original site will rise above in rankings? No, it does not guarantee anything. It will only help Google optimize their search algorithm so that in future less scraped sites rank high in search results. 4- My site is manually penalized, should I file the report? No, if your site is manually penalized, this means your site is not in good faith with Google and it violates the Google's Webmasters guidelines. Hence, first come in good terms with Google before you must file this report.